Will the Apple iPad slow development of mobile websites? Will Apple’s release of the iPad slow the surge past few years of mobile web development? Some people think so. The release of Apple’s ever popular smartphone, the iPhone, back in mid 2007 caused a huge development spike in websites and dynamic web applications designed the mobile devices. Of course, the vast majority of these mobile website were developed specifically with the iPhone in mind, however the results were beneficial to pretty much all smartphones with the capability the browse the web and with some form of web browser application. So, why do I think the iPad will slow this development in the mobile web market? The iPad is a mobile device itself is it not? Well, perhaps not. Apple’s iPad does indeed use an operating system very similar to the iPhone, with backwards compatibility with almost all of the iPhone’s downloadable apps, and yes, it is mobile in the true sense of the word – it can be easily carried around unlike a full desktop computer and much more easily than a typically larger and much heavier laptop. 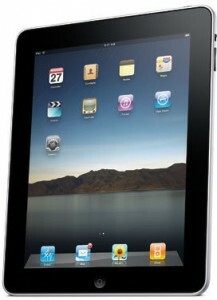 However, the one aspect of the iPad which stands out is its native screen resolution of 1024×768. This means that, since most web developers design, template and style their websites for resolutions of either 800×600 or 1024×768, normal websites look fantastic on the iPad. Why build an iPad specific ‘mobile’ version of a website when your existing site works perfectly, fills the screen and looks fantastic? If you’re interested in getting a design done for Apple products, be it the iPhone, iPad or just any Macintosh system, take a look at our website’s web design section. Hopefully it will spike your interest.